High priest (c. 30 B.C.). He was deposed by Herod the Great, his office being given to Simon, the son of Boethus, the king's father-in-law (Josephus, "Ant." xv. 9, § 3). Jesus'father's name in this passage of Josephus (ed. Niese) has the form Φοαβι; the same name was borne by the high priests Ishmael b. Phabi I. (c. 15 C.E.) and II. (c. 60 C.E. ), and is found in rabbinical works (also ). The name is probably Egyptian (see Parthey, "Aegyptische Personennamen," s.v. Φαβις); hence the many variants in Greek as well as in Hebrew texts. 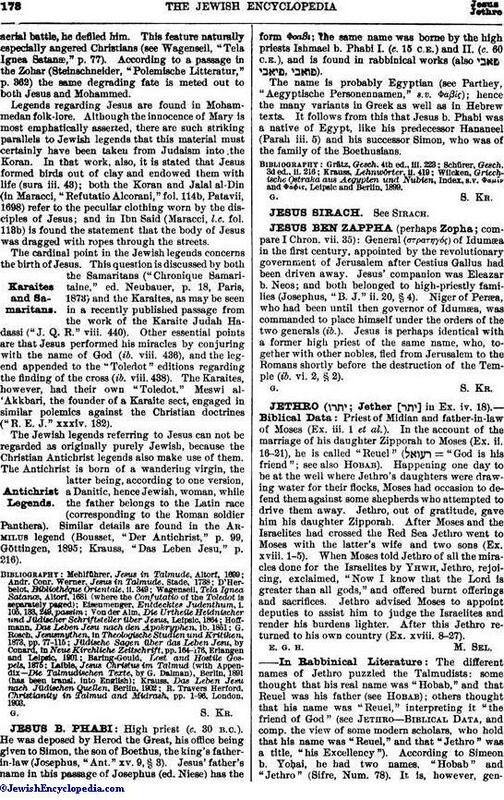 It follows from this that Jesus b. Phabi was a native of Egypt, like his predecessor Hananeel (Parah iii. 5) and his successor Simon, who was of the family of the Boethusians. Wilcken, Griechische Ostraka aus Aegypten und Nubien, Index, s.v. Φαμīν and ΦαΦις, Leipsic and Berlin, 1899.